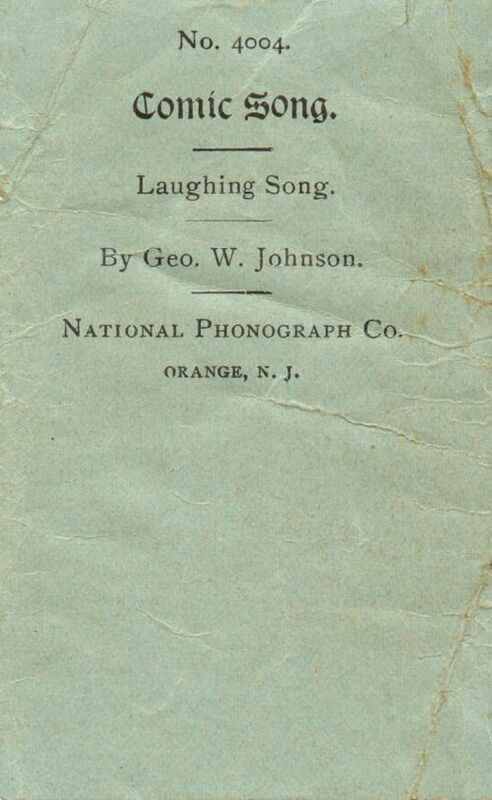 The first black American recording artist, George W. Johnson, sings his great hit The Laughing Song. 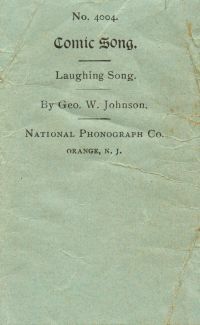 Announcement "The Laughing Song, by Mr. George W. Johnson." Pioneering recording artist, George W. Johnson, was an ex-slave and the first black American recording personality. He "sang" this, his hit song of the 1890s (see lyrics, below), along with his great infectious laugh, literally thousands of times into tens of thousands of phonograph horns. Early recordings by Edison's National Phonograph Company often would not contain the advertisement-style announcement branding it an "Edison record". Also during this era, soloists many times would announce their own records, as is the case here with Johnson. You will see a fearful gap." And then I laughed . . . If he had not been a quince. To what I'm going to say. With my simple little lay. Just to end it with a laugh. Johnson's lyrics read 'Africa', but what does he sing? Aferker? Aspirin?? You judge!